When your supporters refuse to stand behind you, your strength goes down. Some of the traditional supporters may be voting for anti- BJP parties. Which means that even chemistry may be going against the ruling party. In the run-up to the 2014 general poll, Narendra Modi was asked by an interviewer how he would cross the magic figure of 272, as the numbers were not adding up. His answer was simple: this is not an election of arithmetic but of chemistry. He was right: the exceptionally bad two successive governments under the Congress-led United Progressive Alliance had created such a political situation that people began yearning for something better, something new. Modi fitted the bill. The BJP ‘s (Bharatiya Janata Party) dismal performance in the recent by-polls in UP and Bihar, however, has underlined that chemistry is dead, and arithmetic is back in the reckoning. 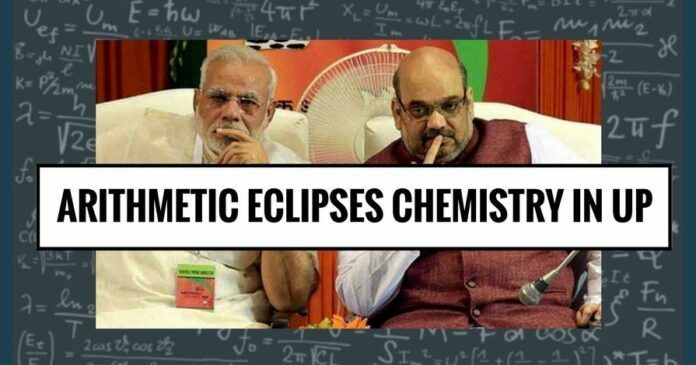 In fact, being an exact science, arithmetic has always played a role in Indian politics; in exceptional circumstances, however, chemistry eclipses arithmetic. That is, Modi was able to convince a large section of the electorate that he was the right choice; the convincing was so thorough that all the calculations of analysts and experts went awry; the BJP won decisively. Earlier, it had happened in 1977, when Indira Gandhi and her son Sanjay Gandhi’s tyranny, along with the excesses of the Emergency, cost the grand old party dearly; for the first time after Independence, it lost power. It happened again in 1989 when an ingenuous Rajiv Gandhi lost to the disingenuousness of a crafty V.P. Singh. Modi regime is essentially socialist in ideology, mindset, and disposition. But Modi and his man Friday Amit Shah seem to have lost sight of the fact that chemistry is not a regular occurrence; in the last 13 general elections, it played the critical role thrice only. It presupposes a mood: it was anger (with authoritarianism) in 1977, disappointment (with Rajiv’s cluelessness) in 1989, and hope (emanating from Modi’s promises) in 2014. And without chemistry, arithmetic asserts itself, as it did in UP in particular, with the unexpected tie-up between the arch-rivals SP and BSP. In Bihar, there were no changes: while the Rashtriya Janata Dal retained the Araria Lok Sabha constituency as well as the Jehanabad Assembly seat, the BJP managed to keep the Bhabhua Assembly seat. It is UP, the largest and most important state, which is sending ominous signals to the saffron party. Less than a year ago, it gave thumbs up to whatever Modi said, did, and stood for. UP’s people even forgave, rather rewarded, him for the disastrous demonetization of high-currency notes he had unilaterally carried out in November 2016. Millions of jobs were lost, the entire ecosystemswere hurt or destroyed, and the economy suffered just because the Modi-Shah duo was desperate to win a state election. The duo succeeded in convincing the populace that everything was for the good of the man in the street and, equally importantly, to penalize the corrupt and the rich. The mass feeling is best described by the German word ‘schadenfreude,’ described by www.dictionary.com as ‘satisfaction or pleasure felt at someone else’s misfortune.’ Not the noblestof feelings indeed, but then there is little noble in politics, certainly in Modi-Shah’s politics. But the bottom line was that they won handsomely, winning over three-fourths of Assembly seats. Unfortunately, the ruling dispensation has not been as capable in policy formulation as it is adept in winning elections. It can promise but it can’t deliver; and this is primarily because the Modi regime is essentially socialist in ideology, mindset, and disposition. I have written copiously about its orientation; whether it is the issue of the ownership of public sector banks, labour reforms, or opening up the farm sector, the government is usually in agreement with big state enthusiasts. When a party’s core constituency shows apathy to polls, it should get worried. And because the big state needs big money all the time, the government under Modi is always in search of it. The long spell of low crude prices filled the exchequer at the expense of vehicle owners, but the hunger for more never gets quelled. Income-taxpayers have got little relief in the last four years; traders, shopkeepers, and businessmen are tormented by GST. And the government, unresponsive to the concerns of the taxpayer, is just telling them that their money is being used for nation-building. Of course, part of nation-building is also keeping the Vijay Mallyas, the Nirav Modis, and the Mehul Choksis in good humour, but that’s another story. The upshot is that the salaried class, traders, and shopkeepers—indeed the entire middle class—are suffering because of the unimaginative policies, the callous approach of the government, and the overbearing attitude of taxmen. Come to think of it: though urban areas are usually BJP strongholds, in the Assembly segment of Allahabad North the voter turnout was just 21.65 percent and in Allahabad West it was 31 percent (bother in Phulpur). Similarly, Gorakhpur City saw 33 percent voting. What the BJP doesn’t realize is that they may not go anywhere—that is, they may just skip voting. 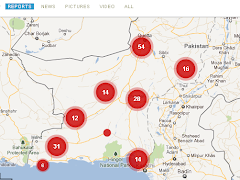 Many of them did in UP; a few months ago, a similar pattern was noticeable in Ajmer and Alwar, the two Lok Sabha constituencies in Rajasthan where the BJP was trounced. When your supporters refuse to stand behind you, your strength goes down. This is common sense and simple arithmetic. Worse, some of the traditional supporters may be voting for anti-BJP parties. Which means that even chemistry may be going against the ruling party. A very interesting and thought provoking article.